Background: Pain is a very frequent symptom of acute burden towards the body. Pain is frequently seen among most cancer patients. Objectives: In this study, we aimed to present a Pain Frequency Intensity and Burden Scale (P-FIBS) in Turkish. Setting: 138 cancer patients who applied to Saglik Bilimleri University, Izmir Tepecik Training and Research Hospital, Oncology Outpatient Clinic were included in the study between Jan and Mar 2016. Materials and Method: The participants completed the sociodemographic form, VAS, SFMPQ and PFIBS. The Cronbach α and fit indexes were calculated. Results: The mean age of the patients was 52.02 ± 8.46. 71.7% of the patients were female, 28.1% were men. The mean VAS score was 3.56 ± 23.17; the mean SF-MPQ score was 9.64 ± 8.34, and the mean PFIBS was 12.67 ± 8.35. The Cronbach α of the P-FIBS was 0.889. The item-total item correlation coefficient (r) was 0.77. Firstly, the Confirmatory Factor Analysis, Cmin=1.283, df=2, Cmin/df=0.641, Goodness of Fit Index (GFI)=0.995, Adjusted Goodness of Fit Index GFI (AGFI)=0.977, RMSEA (Root Mean Square Error of Approximation)=0.000, which reflected perfect fitness among Turkish cancer patients, were measured. Limitations: The number of participants could be more increased but the fit indexes were excellent for our sample. Conclusions: In a study conducted previously in Turkey, the general pain average was 63.7%. In our study, this ratio was found as 99.93% for VAS, 95.7% for SF-MPQ and 97.1% for P-FIBS. It stems from the characteristics of the study population. Our study (P-FIBS) is the first study conducted among cancer patients in the world and has a good internal reliability and validity. In Moroccan, Persian and British studies conducted with SF-MPQ, the descriptors were equal to ours. Pain is a warning message of possible or actual injury to the body. International Association for the Study of Pain (IASP) described pain as “an unpleasant sensory and emotional experience associated with actual or potential tissue damage, or described in terms of such damage” . The Joint Commission on Accreditation of Healthcare Organizations described the pain as the “fifth vital sign” . A physician should be familiar with this symptom . Pain perception is described as neuromatrix theory of the pain influenced by many factors. This theory suggests that people experiencing pain live it as a cognitive, sensitive and perceptive complex originated by many areas of the brain. Pain is not considered as a single sensitive input but as a complex input sent to the neuro-matrix . According to a study, 100 million citizens suffered of pain and this cost $ 600 billion annually in United States . Pain is a frequent symptom among cancer patients. In a largescale study with patients of five regions in Turkey, 70% of the patients described cancer pain. These percentages increased to 90% in terminal phase . Pain occurs due to cancer or its treatment. More than 50% of the cancer patients suffer from moderate to severe pain . In another study, pain was present in 18.4% of the cancer patients and inadequate pain control was 54.2% . To monitor the level of pain, there are many popular scales like VAS (Visual Analogue Scale), Numerical Rating Scale (NRS), Brief Pain Inventory (BPI), Short Form Mc Gill Pain Questionnaire (SF-MPQ) [8-12]. In this study, the aim is to introduce the cross-cultural Turkish adaptation of a new pain scale, P-FIBS, which may be useful in the clinical use along with the other valuable pain scales for the patients suffering of pain in Turkey. The study is performed among the cancer patients who had been followed-up in Saglik Bilimleri University, Izmir Tepecik Training and Research Hospital, Oncology Outpatient Clinic between Jan and Mar 2016. Firstly, it was planned to include 155 cancer patients with their own consents. However, 17 of them did not complete the questionnaire successfully. In total, it was 138 patients who had completed the questionnaire. The questionnaire constituted of a sociodemographic form (age, gender, economic and educational level, diseases and pain duration) and VAS, SF-MPQ and P-FIBS. Visual Analogue Scale (VAS) is an instrument measuring a characteristic or attitude (pain etc.) among values ranging from none to the extreme amount. Generally VAS is a horizontal line in 100 mm length. The line could be also vertical. Left side means “no pain” i.e. zero, right side means maximum pain. The patient marks the extent of the pain she feels on the line. VAS is a uni-dimensional measure of pain intensity (A4). The cut points are: no pain (0-4 mm), mild pain (5-44 mm), moderate pain (45-74 mm) and severe pain (75-100 mm). Testretest reliability is good (r=0.94, P<0.001). The SF-MPQ is a shorter multi-dimensional version of Mc Gill Pain Questionnaire. It was developed by Melzack. The short form consists of 15 words (11 sensory and 4 affective). The ratings are 0=none, 1=mild, 2=moderate or 3=severe. The SFMPQ also includes 1 item for present pain intensity and 1 item for a 10 cm Visual Analog Scale (VAS) for average pain. The Cronbach alpha coefficients were estimated at α=0.73-0.89. The test-retest reliability ranged between 0.45-0.73. P-FIBS were developed by De la Cruz. It is a brief and selfadministered scale for the measurement of pain frequency, intensity and burden. Items are rated by 0-8 Likert scale. Lower scores indicate less pain or burden during the past week. Item-total correlations coefficient ranged between 0.70-0.85 with a high Cronbach’s alpha coefficient 0.90. Classical Test Theory (CTT) analysis was used to assess the item-correlation and Cronbach α. The Confirmatory Factor Analysis was performed to measure the fit indexes with the AMOS program. The Pearson Correlation was performed between the scales by SPSS Program, version 22. The mean age of the patients was 52.02 ± 8.46. 71.7% of the patients were female, and 28.1% were men. The mean disease duration was 24.95 ± 38.02 months. The mean pain duration was 10.68 ± 5.34 months. The mean of the VAS score was 3.56 ± 23.17, the mean SF-MPQ score was 9.64 ± 8.34, the mean PFIBS was 12.67 ± 8.35. The sociodemographic factors are indicated in Table 1. The internal reliability Cronbach α of the P-FIBS was 0.889. The item-total item correlation coefficient (r) was 0.77 reflecting good construct validity. According to chi-Square analyses demonstrated in Table 2, the independent variables, i.e. age, socioeconomic level and pain duration were found to be statistically significant with P-FIBS 2 score (p<0.05); and the disease duration was found to be significant with the total Mc Gill short form and P-FIBS 1 score. Table 3, reflects inter-correlation coefficients (r) of the pain scale PFIBS (all values are over 0.5 reflecting good correlation between them). The pain duration was found to be significant with the total Mc Gill short form and with all P-FIBS item scores. Drinking alcohol variable was found to be significant with the total Mc Gill short form score (all Somer’s d positives, all p<0.05). Table 1: Sociodemographic and disease characteristics of the participants (*TL: Turkish Lira). Table 2: Comparison of the independent variables with the pain scale scores. The higher the independent variable value, the higher pain scale score (*p<0.05). Table 3: Inter-correlation coefficients (r) of the pain scale scores. Mean r=0.65 (*p<0.05). Internal reliability Cronbach α value was 0.889. This reflects that P-FIBS have high grade value for test reliability. In the first order, the Confirmatory Factor Analysis was calculated by AMOS, Cmin=1.283, df=2, Cmin/df=0.641, Goodness of Fit Index (GFI)=0.995, Adjusted Goodness of Fit Index (AGFI)=0.977, RMSEA (Root Mean Square Error of Approximation)=0.000. These results indicate a perfect fitness of the P-FIBS scale on the Turkish patient sample. Figure 1 reflects the confirmatory factor analysis of Turkish adapted PFIBS scale. 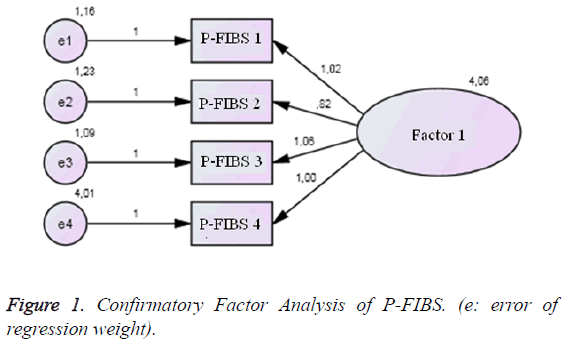 Figure 1: Confirmatory Factor Analysis of P-FIBS. (e: error of regression weight). In a Turkish study of 3000 patients in fifteen cities of Turkey in 1999, the general pain average was 63.7%. In our study, this ratio was found as 99.93% for VAS, 95.7% for SF-MPQ scores and 97.1% for P-FIBS. It stems from the characteristics of the study population. Among female patients living in the western cities, this ratio was high on the head and in lower extremities in men living in rural areas (p<0.001). The pain was found to be increased with the age (p<0.001). However, this was not the case in our study. Almost half of the pains were present every day (44.6%), 1/4 of the pain continued four-twelve h (24.6%). 26% of the pains were excruciating (p<0.001). The first described pains were on the head (34.4%), on the back (14.1%), in lower extremities (12%) and in the abdomen (10.9%). The 48.9% of the participants in this study described their pain starting without any cause or starting spontaneously . The original study of P-FIBS was firstly used to assess the pain degree among psycho-stimulant drug abuse treatment patients doing aerobic exercise for relapse prevention. However, the use of it has been confirmed in every case with high reliability and validity. Having translated the P-FIBS, our study is the first study conducted among cancer patients in the world. We also had a high reliability and convergent validity. Turkish PFIBS has some advantages over the other pain scales such that it assesses multiple aspects of the pain and not only the intensity like VAS and NRS. In addition, Turkish P-FIBS assesses the effect of the pain in daily life. It is also shorter than the other scales like Mc Gill and Brief Pain Inventory (BPI). It is also easier and faster to complete than other scales . In the Moroccan study among cancer patients, Cronbach α of SF-MPQ was 0.88. P-FIBS has demonstrated an excellent reliability in our study (α=0.89). The most frequent sensory complaints were “throbbing”, “shooting” and “burning”. In our study, the most frequent sensory descriptors were “aching”, “shooting” and “cramping”. The most frequent perceptual descriptor was “tiring/exhausting” in the two studies. In this study, the mean VAS score was 6.6 ± 2.4, SF-MPQ 11.9 ± 7.8. In our study, the mean VAS value was 3.56 ± 23.17 and the mean SF-MPQ was 9.64 ± 8.34 . In the Persian adaptation study of SF-MPQ-2, the Cronbach α was 0.88, which is similar to our study, and the correlation coefficient (r) between the items was around 0.6, which is the case in our study . In the study performed in the UK among malignant pleural mesothelioma patients where many pain scales are used for describing the pain, SF-MPQ was also included. The top three frequent sensory descriptors of SF-MPQ scales were “aching”, “tender” and “sharp” . These descriptors were similar to ours. The number of the participants could be considered insufficient. But a larger sample could not pose a better result than ours because P-FIBS had an excellent goodness of fit index in our sample, too. Chapman CR, Casey KL, Dubner R. Pain measurement: An overview. Pain 1985; 22: 1-31. Joint Commission. Facts about pain management. Joint Commission Pain Management. 2013. Cohen SP, Raja SN. Pain. Cecil 24th edition. Elsevier Saunders Philadelphia 2012; 133-139. Sarıhan E, Kadıoğlu E, Artıran İğde F. Kanser ağrısı, tedavi prensipleri ve dünya sağlık örgütü ağrı basamak tedavisi. Nobel Med 2012; 8: 5-15. Relieving pain in America: a blueprint for transforming prevention, care, education, and research. Inst Med 2011. Parás-Bravo P, Paz-Zulueta M, Alonso-Blanco MC, Salvadores-Fuentes P, Alconero-Camarero AR, Santibañez M. Association among presence of cancer pain, inadequate pain control, and psychotropic drug use. PLoS One 2017; 12: 0178742. Bennett M, Paice JA, Wallace M. Pain and opioids in cancer care: benefits, risks, and alternatives. Am Soc Clin Oncol Educ Book 2017; 37: 705-713.
dela Cruz AM, Bernstein IH, Greer TL, Walker R, Rethorst CD, Grannemann B, Carmody T, Trivedi MH. Self-rated measure of pain frequency, intensity, and burden: psychometric properties of a new instrument for the assessment of pain. J Psychiatr Res 2014; 59: 155-160. Breivik H, Borchgrevink PC, Allen SM, Rosseland LA, Romundstad L, Hals EK. Assessment of pain. Br J Anaesth 2008; 101: 17-24. Peters ML, Patijn J, Lame I. Pain assessment in younger and older pain patients: psychometric properties and patient preference of five commonly used measures of pain intensity. Pain Med 2007; 8: 601-610. Jensen MP, Chen C, Brugger AM. Interpretation of visual analog scale ratings and change scores:a reanalysis of two clinical trials of postoperative pain. J Pain 2003; 4: 407-414. Hawker GA, Mian S, Kendzerska T, French M. Measures of adult pain: visual analog scale for pain (vas pain), numeric rating scale for pain (NRS pain), mcgill pain questionnaire (MPQ), short-form mcgill pain questionnaire (SF-MPQ), chronic pain grade scale (CPGS), short form-36 bodily pain scale (sf-36 bps), and measure of intermittent and constant osteoarthritis pain (ICOAP). Arthritis Care Res 2011; 63: 240-252. Erdine S, Hamzaoğlu O, Özkan, Balta E, Domaç M. Türkiye’de erişkinlerin ağrı prevalansı. Ağrı 2001; 13: 22-30. Rouahi N, OuazzaniTouhami Z, Ahyayauch H, El Mlili N, Filali-Maltouf A, Belkhadir Z. Assessment of the nature and severity of pain using SF-MPQ for cancer patients at the national institute of oncology in rabat in 2015. Asian Pac J Cancer Prev 2016; 17: 3997-4001. Kachooei AR, Ebrahimzadeh MH, Erfani-Sayyar R, Salehi M, Salimi E, Razi S. Short Form-McGill Pain Questionnaire-2 (SF-MPQ-2): A cross-cultural adaptation and validation study of the persian version in patients with knee osteoarthritis. Arch Bone Jt Surg 2015; 3: 45-50.